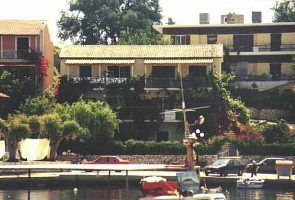 Situated in the little village of Kassiopi on the north-east coast of Corfu island, Manessis apartments are a mere 2 minute walk from the nearest beach. The house commands one of the finest views overlooking the picturesque harbour and allows easy access to all facilities. As well as historic sites and pretty scenery Kassiopi also tempts visitors with excellent swimming in crystal clear waters in the numerous pebble coves surrounding the village. The country side and mountains around the village make for excellent walking and the views are absolutely breathtaking. All in all Kassiopi is probably one of the most beautiful and unspoilt villages on Corfu island today. Manessis Apartments: This privately owned house has 4 apartments fronted by beautiful gardens. Inside the apartments are spacious and comfortably furnished with fully equipped kitchens and choice of bath or shower. The apartments on the upper floor have excellent private balconies overlooking the harbour and a view of Albania. The apartments downstairs have patios with barbecue, sun loungers and full use of the garden. All apartments have mosquito nets and fans. Electrial appliances: Sandwich toaster, toaster, automatic kettle, iron, plug-in mosquito machines, clock/radio. Transport: From Corfu airport to Kassiopi by car takes approx. 45mins. Taxis are easily available at the airport. There are bus and boat services between Kassiopi and Corfu town. Excursions and car hire are available at local travel agencies. Top floor apartments have baths with shower . Garden apartments have shower units only. Fans and mosquito nets in bedrooms. Weekly maid service. Swimming pools and tennis courts are within 5 mins walk. Wonderful stay at the Manessi apartments..
My mother and I had a fantastic stay at the Manessi apartments. First class attention to detail from Diana, as on arrival from Scotland, which was two hours late and after midnight she still welcomed us herself and introduced us to her homemade cake, cold, drinks and all the other necessities needed on arrival. The standard of the apartment was really high, with all the essentials and spotlessly clean just perfect. I must mention the mosquito nets on all doors and windows which was a plus and should be a must for other renters. I would like to thank the Manessi’s for a relaxing stay and stress free time at their apartment. Final words, we will be back hopefully in the future. This is an adorable apartment set in beautiful gardens overlooking the gorgeous harbour. We had such a lovely few days there. Diana was hospitable, friendly. Helpful and welcoming. Nothing felt like too much trouble. We were a family of four with two teenage girls, 15 and 17 who loved it. There is a crystal clear beach 5 minute walk away with shops and tavernas literally on the doorstop. We would definitely recommend manessi apartments if you visit kassiopi. One of the nicest holidays we've ever had! We had an absolutely delightful stay here in June. The balcony was shady in the morning, but even when it got really hot in the afternoon there was always a lovely breeze, & we happily spent hours sitting watching boating activities in the harbour. Evenings around the harbour were lively, but with double glazing & fans/air conditioning, noise was never a problem. The apartment is perfect & very clean; Diana provided refreshments for our arrival, the beds are very comfortable & the bathroom is modern. Kassiopi is a lovely little town with lots of excursions by road and sea. We are going again next year! Thank you so much for the wonderful review. I look forward to seeing you next year. A Holiday to remember in a Lovely Apartment. I wish to endorse what other reviewers have said about this property. Everything and more was exactly as described. When we arrived on a lovely summer day we did not know Diana but she very soon became a personal friend. We had arrived minus my wife`s suitcase which had gone astray on Easyjet. As soon as we told Diana she insisted on taking my wife in her car to the next village to buy essential items. She then gave my wife a tour of the village.before returning. Once back at our apartment she took my wife upstairs to her own apartment where she opened her wardrobes and told my wife to choose whatever clothes she needed until her suitcase arrived, which it did two days later. Things only got better after that . There was everything that we could need or want including Diana`s welcome pack of Greek foods including home made jam and a lovely pudding ,,together with Ginger Beer and Wine and other welcome items like biscuits. In the pleasant front garden there were tables and chairs with Lemon trees loaded with fruit, plus as mentioned before, a family of Tortoises. We stood in the garden one evening with a glass of wine each and looked over the hedge at the lights twinkling on the Harbour and people strolling past enjoying the beautiful evening, and we knew then that we had made the best choice ever for our holiday. We were especially pleased to be able to use the splendid library provided by Diana for the use of her guests. The beds were very clean and comfortable and with the curtains drawn and the ceiling fan turning slowly we were able to sleep soundly with only very muted sounds from the Harbour area. To sum up, Diana is a lovely lady in the real sense and nothing is too much trouble to ensure that her new friends have a holiday to remember, and that is certainly what she gave us. I must mention Vera and Mike whose C O S M I C Travel Agency in the main street we used for all our boat and coach trips during our stay. They also became good friends together with Costas, the Captain of one of their boats, who made our sea trips so enjoyable and memorable. Lovely people all. We had a glorious week and when it was time to leave, Diana and other friends from South Wales came over to the Harbour to wish us a safe journey and we were so moved that Costas came especially from his boat to say goodbye. We were very sad indeed to leave, but so pleased to have met such lovely people. We keep in touch with Diana through emails, and we shall return asap. Everything we had hoped for and a little bit more! This does not need to be a lengthy review, but merely a recent endorsement of all the previous reviews, which are all positive and still contemporary. We had a great time staying at our upstairs apartment and were so impressed at the hospitality that Diana afforded us as family of 4 with 2 teenage girls. There are so many small subtle things in the apartment that Diana has obviously thought about over the years and added in an effort to make sure that her guests feel welcome and comfortable. We certainly appreciated it all and found Diana to be such a warm and receptive host. We hope to return again one day when our teenagers have flown the nest. Thanks again Diana - all much appreciated. This is a little gem of a place in a beautiful location. We found everything we needed in the apartment - from air conditioning to washing up liquid, a library of books, everything for the beach, and a welcome pack including fresh bread, home made jams, and a delicious home made pudding from Diana. The apartment is suitable for couples and families, with a modern bathroom, double glazing, and mosquito blinds and nets which keep out the pests. We were on the ground floor, which gave us access to the lovely garden ( and tortoise family), yet was secluded from the road nearby. Kassiopi itself has an attractive harbour where you can watch the boats, with a good selection of restaurants ( we liked Petrino - good value for excellent food), bars and shops, - big enough for some variety, but not too big compared to busier resorts. There are three beautiful beaches all within easy reach, and several small coves and rocky pools to explore. Diana lives in the apartment block, and was always around to help and give some advice about the area. She arranged a taxi to and from the airport ( we arrived and left on a Sunday, so no public transport) at reasonable rates, and a very reliable service. We felt she understands what people really want from a holiday, and her personal touches made our holiday complete - she really loves where she lives, and wants everyone to enjoy it as she clearly does. We can highly recommend these apartments and Kassiopi for a relaxing and enjoyable holiday. Kassiopi is situated on the north east coast of Corfu, looking across to Albania. It is 38 kilometres from Corfu town. and a 45 minute drive from the airport.